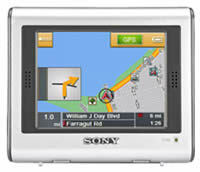 Leave the Thomas guide at home, and hit the open road with the NV-U70 portable satellite navigation system. The perfect companion for long trips, or a short ride across town, the NV-U70 features a brilliant, full-color, 3.5" touch-screen display, resident two-way speaker system, and is pre-loaded with maps of the US and 1.6 million other points of interest. Ready for use right out of the box, the NV-U70 contains a 12-channel GPS receiver with proprietary RF technology, a built in antenna and 1GB of imbedded flash memory. This convenient, user-friendly, compact system can be easily mounted on the windshield or dashboard of virtually any vehicle. Its imbedded rechargeable lithium-ion battery allows up to four hours of operation outside of the car. Switch on the cruise control and let the NV-U70 portable satellite navigation system make your next trip a breeze. This page is part of GeneralManual.Com Network Sony NV-U70 Portable Satellite Navigation System User Manual.